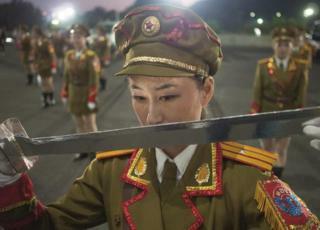 A new photographic exhibition on North Korea offers a rare glimpse of everyday life in the isolated state. A female dance troupe in military uniform perform high kicks in a car park. A young man in a brimmed hat on a train poses in sunglasses with his tie loosened around his neck. A mother and child play by the seaside with an inflatable duck. These are some of the scenes captured by photojournalist Nick Danziger in Above The Line: People and Places in the DPRK [Democratic People's Republic of Korea] - an exhibition of some 80 large-scale colour photographs at the British Council in London. "Hopefully, the images give you a sense of what daily life is like in North Korea," says Danziger, who took the pictures during an official trip to the country last year. Visiting the cities of Pyongyang, Wonsan, Nampo and Sariwon, Danziger shows people enjoying activities that could be happening almost anywhere in the world. The aim of his visit had been to run a photography and writing workshop with 12 North Korean citizens, culminating in an exhibition of their work shown first in Pyongyang, then in London. The workshop never happened, but Danziger returned with 7,000 photos of his own from which he selected the images for the London show, and an accompanying book. Danziger and his companions - the British Council's visual arts director Andrea Rose and writer Rory MacLean - were accompanied most of the time by official North Korean "minders". The photographer admits the trio didn't have an easy time. "Every single day was a battle. It was a struggle for us to be able to carry out our work. We had all sorts of ruses to be able to work independently. "Our guides often said the people wouldn't want to be photographed, but when we asked them, I don't think we were ever turned down." A visit to beach - when their guides were keen to go swimming - provided an ideal opportunity for Danziger to meet the locals unaccompanied. "I don't speak Korean but what's extraordinary is how welcoming how people were," he says. "The women were quite coquettish. Lots of people were having barbeques and I was offered drink - usually alcoholic - and skewers of meat. Although we couldn't communicate verbally, the human contact was fantastic." What difficulties did he see? "Daily life is a struggle, certainly compared to the way that we live today. They don't have much technology. There are very few machines - so there are images of seeding grass by hand and cement being mixed with feet." He says that many children in his pictures appear smaller than their ages would suggest. "There is no fat on the land, as it were, and that reflects itself in the way that people are built." Despite the hardships, Danziger says he observed that "life goes on". It's something that chimes with his personal experience in other countries such as Afghanistan. "People do try and get on with their daily lives. I visit many war zones around the world. People are always surprised to see people living in difficult circumstances smiling in photographs." The British Council describes Danziger's photo exhibition as "the first cultural engagement of its kind" between the UK and the Democratic People's Republic of Korea. "Everyone watches everyone in North Korea," he says. "But I do feel like we did come away with something that's different from the regular news pictures of huge choreographed marches." Above The Line: People and Places in the DPRK is at the British Council headquarters in Spring Gardens, London SW1A until 25 July (free entry).